A headset that moves with you. 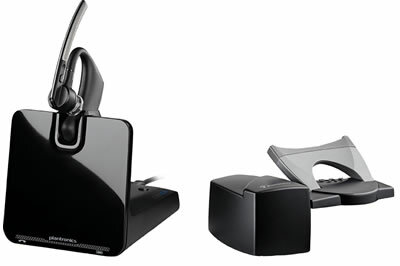 When you're on the go, at the office or on the road, the Plantronics Voyager Legend CS moves with you. For those with flexible work and lifestyles, the Legend CS connects to your smartphone and office phone so you can work better on both. With incredible sound quality, voice controls and smart charging systems, it's the right choice for people on the go. The Voyager Legend CS has a precision-tuned triple-mic with enhanced Digital Signal Processing (DSP) to provide superior noise cancellation. Advanced WindSmart technology provides three layers of wind protection. Integrated Advanced Audio Distribution Profile (A2DP) lets you listen to streaming media from your smartphone or tablet. Our new Smart sensor technology creates a seamless and intuitive user experience by automatically answering calls simply by placing the headset on your ear and automatically transferring calls between your smartphone and headset. The sensor answer feature is available for desk phone calls when paired with the HL10 lifter or EHS cable. You can also add an online indicator light to let your colleagues know when you're on the phone. The new voice command menu allows you to use your voice to answer calls, check battery level, redial and a host of other tasks. When using your smartphone, the Caller Name Announcement feature lets you know who's calling without you needing to look at your mobile phone. Enhanced voice alerts announce remaining talk time, connection status, battery level and mute so you can work smarter. We will contact you for model.